Newspaper journalist, Annie, is in a dilemma. She is on the cusp of a major sting and under pressure from her editor to run with a story based on illegal phone hacking. Taking the moral high ground, she refuses. Meanwhile, on the home front, she is ‘hacking’ into her husband’s phone on a daily basis to read his messages. “Carl’s Story” is full of contradictions such as this. To be human is to be hypocritical, and vice versa. Writer and director Gavin Miller does not shy away from admitting we are all flawed, as he challenges our views on guilt, fidelity, friendship, family and, most poignantly, truth itself. Set in an Art Club café, the fourth wall is broken from the outset in this hybrid of a show; a mix of monologue, duologue and dialogue. A mix of toilet humour and kitchen sink drama where moments of sharp comedy inform home truths. Miller has a particular knack of handing us the wrong end of the stick and his skill as a writer allows us to piece together the story, and backstories, bit by bit, until we twig. The only drawback, however, is that the sometime slow pace eventually allows us to overtake and to see the plot twists coming. 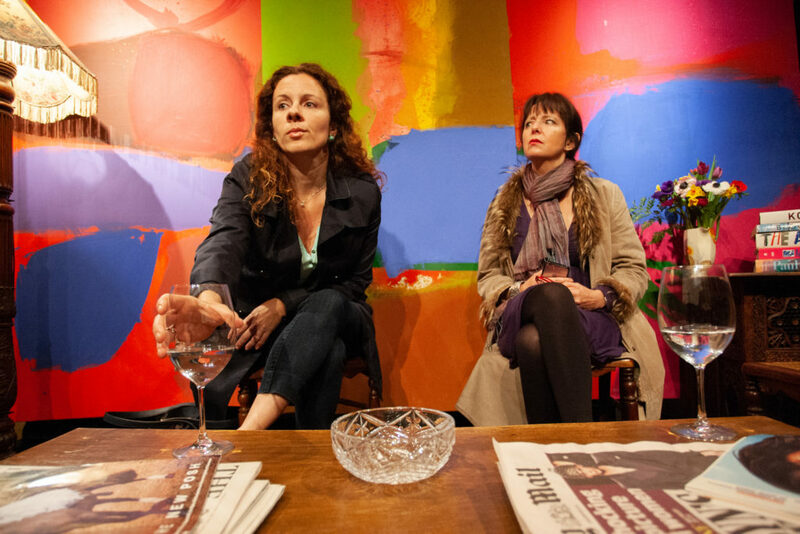 Annie (Jenny Whiffen) has chosen the art café to meet up regularly with best friend Beth (Emma Bernbach) to discuss the nitty-gritty of life’s (and their own) affairs. During these, often wine-fuelled tête-à-têtes, Annie offers up her husband, Carl, for a romantic fling with Beth. But not in front of Annie’s headstrong, moody daughter (Lucia Dean) who uses the café to do her homework. When Beth’s ex-husband (Tommy Carter) appears, dark secrets come to the surface and the two women’s friendship is called into question. “I never lied to you” quips Annie, “I just didn’t tell you the whole truth”. Whiffen and Bernbach both feast on the dialogue and chemistry between these two strong yet vulnerable women, giving perfectly pitched, natural performances; while Dean thankfully avoids the ‘Ab-Fab’ pitfalls with her lively portrayal of the all-knowing, mocking teenage daughter. Carter imbues compassion into the ex-husband who initially appears to have an unsavoury past. It is no give-away to reveal that Carl never shows up in his own story, though he is always in the foreground. His story touches all the characters’ lives with a poignancy that ultimately touches us. Miller has crafted a fine piece of writing, peppered with Wildean witticisms for the TV Sitcom era, and fine-tuned by a very watchable cast. Without knowing it we are lured into looking inside ourselves. We are all guilty of blurring the distinction between ‘telling a lie’ and ‘not telling the truth’. A subtle differentiation, that we all too often use to our advantage when it suits. But this play goes deeper than that; it looks beyond the dysfunction, the compromises, the divisions and disloyalties that can fracture a friendship or a family in a stroke. Its truth lies in its sad yet unsentimental coda; that life is too short for all that ‘what-is-truth’ nonsense.